I’ve been successfully upping my mileage over the past few weeks. After running my marathon in September, my mileage went from near 200 miles a month down to about 40. Mixed in there were various injuries, specifically my hip. So I would take time off and then try running again, get hurt, take time off and then try running again (you get the picture). Finally I settled on a 3 mile route in my neighborhood. I ran that route and only that route for a month or so. It was getting really frustrating to be doing so little, but my theory and experience was that I needed to rebuild a base and allow my body to adjust to running again. Here was a guy who just ran 26.2 miles and was having trouble with 3 miles. Anyway, I finally added about .8 miles to my run by running a little different route. This became my route for another few weeks (with a couple long runs built in). So 3.8 miles became my base. A couple weeks ago I added another half mile to my route. That got me up to 4.3 miles a day. Then this week I added another half mile. So now I am close to 5 miles a day. So now I am up to an amount of miles that I feel is acceptable for a while. Generally I try to not add more than 10% to my mileage a week. This will vary if I run a long run with TJ, but I am trying to keep my daily milage to a figure that isn’t more than a 10% increase. The past two days of 4.8 miles have been good runs. Monday was awesome. I went slow and felt I could have run another 5 miles if I wanted to. Yesterday went well. I went a little faster, but it was coooold outside (for Bama). It was 34 degrees with a 10 mph wind. Fortunately I bought a face/neck wrap at Dicks Sporting Goods on Sunday and broke it out. 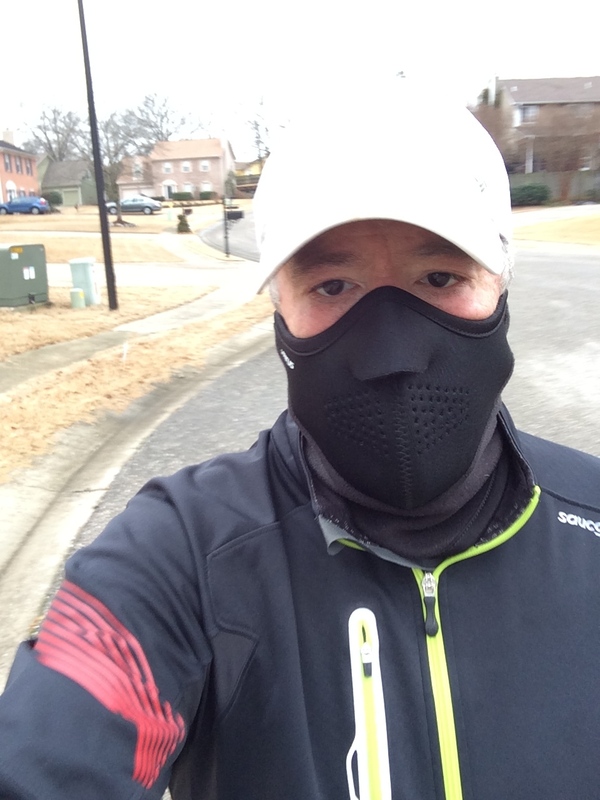 I was warm/really warm for most of my run and all I had on was a light jacket and shorts (along with the wrap). Here is a picture I took after my 5 miler yesterday. My Lovely Wife is enjoying Korean dramas at the moment and so this picture I call my “City Hunter” look! This entry was posted in General run, Running and tagged City Hunter, cold, kdrama, Korean drama, running. Bookmark the permalink. Glad you’re back in the swing of things! Thanks Joey! It is a relief!